Thanks for liking my soaps. If you'd like to learn more about the deforestation-free responsibly produced Palm Oil that goes into my soaps, it's produced by Agropalma. I have sourced palm oil from Agropalma since 2011. 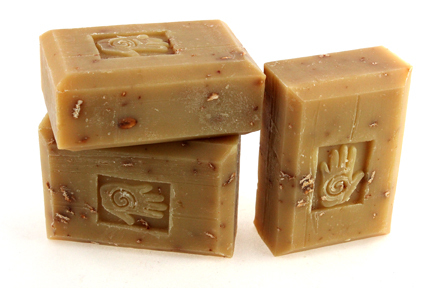 It's rated as or among the most responsible/sustainable organic palm oil on the planet. 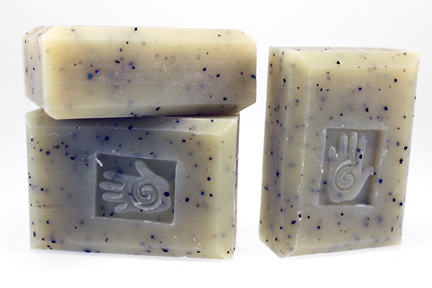 When you use my soaps you can relax knowing there is no destruction of wildlife habitats in the suds. 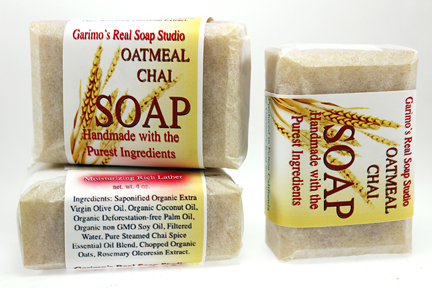 Details on these traditional cold processed soaps and ingredients can be found here. 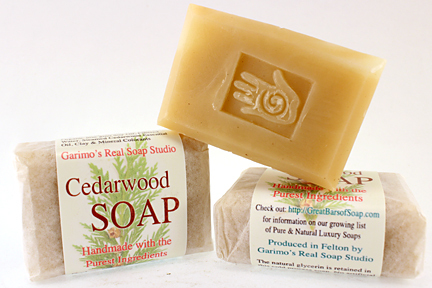 Individual bars of soap cost $7.00 each (includes sales tax) or you can get five bars of any one kind for $32.50. 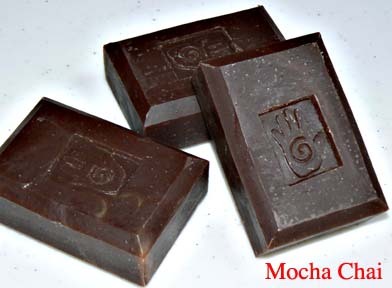 Each bar weighs 4 ounces or slightly more. 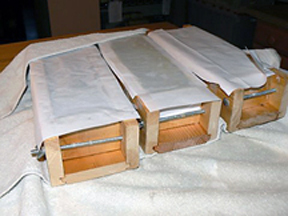 Each bar is wrapped in white tissue paper with a printed paper label. 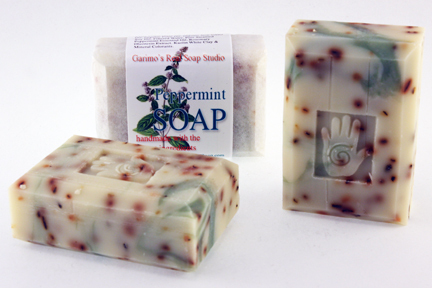 Email or call at the message phone with questions about placing orders or for information about the soaps. 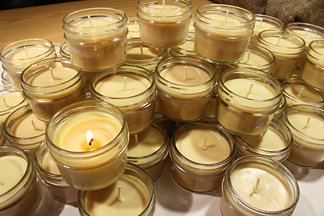 Inquiries about custom made orders for gifts and events are very welcome. I've been known to make special sized bars & lables for brides gifts... need at least 6 weeks notice. 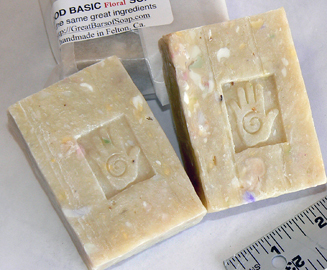 Soap Making Classes are on hold till late spring. Please don't order if it says "OUT OF STOCK"
Each guest bar is 8/10s of an ounce individually packaged in a small envelope. Three of the more popular scents. with your rental information and I'll extend a discounted bulk price. 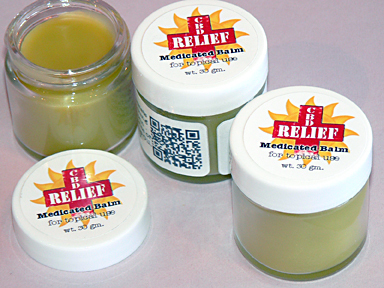 Topical Balm intended for common usage where any healing salve might be used. 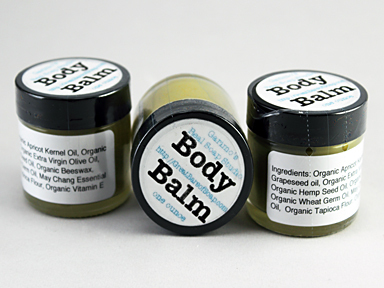 The aloe vera oil in this balm makes it great for burns and sunburns too. 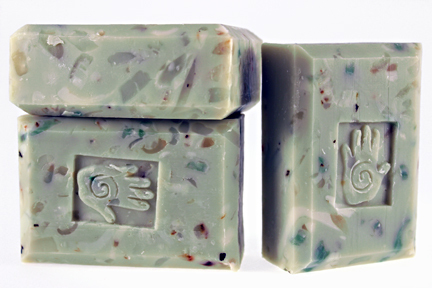 This one tends to heat a little from the essential oils making it great for sore muscles and bruises. 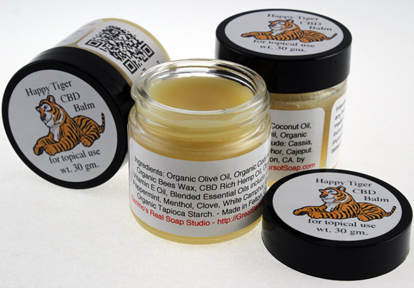 Ingredients: Organic Olive Oil, Organic Coconut Oil, Organic Bees Wax, CBD Rich Hemp Stem Oil, Organic Vitamin E Oil, Blended Essential Oils include Cassia, Peppermint, Menthol, Clove, White Camphor, Cajeput, Organic Tapioca Starch. The main carrier oil is Organic Apricot Kernel Oil and obsorbed about four times faster than olive oil. 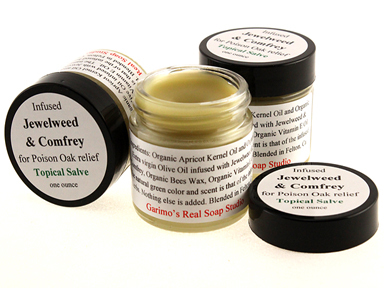 Infused Salve Topical Balm intended for the reduction of itch and skin irratation from Poison Oak & Ivy rash. 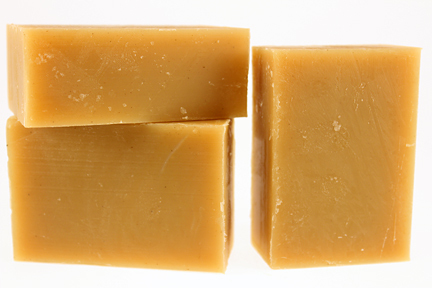 Ingredients: Organic Apricot Kernel Oil and Organic Olive Oil infused with wildcrafted Jewelweed and Organic Comfrey, Organic Bees Wax, Organic Vitamin E Oil, and nothing else. The green color is from the infused herbs. No preservatives, refrigerate for storage. 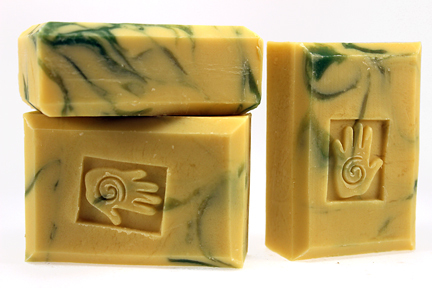 New batch has cannabis like the soap. 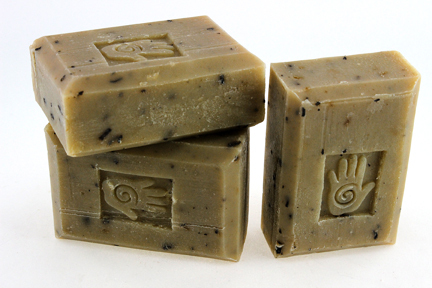 The olive oil in the soap is moisturizing and helps relieve their itchy skin too, and the essential oils may not be toxic and able to kill fleas and their eggs but they do repell and annoy them. 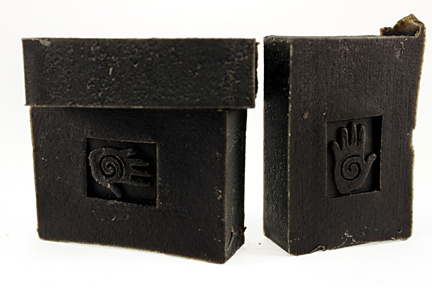 Activated Charcoal and White Willow Bark with light Tree Tree scent. Ingredients: Saponified organic extra virgin olive oil, organic coconut oil, organic deforestation free palm oil, organic non-GMO soy oil, filtered water, pure steamed teatree essential oil, activated charcoal powder, white willow bark powder. Ingredients: Saponified organic extra virgin olive oil, organic coconut oil, organic deforestation free palm oil, organic non-GMO soy oil, filtered water, Infused with Jewelweed, comfrey, & cannabis. 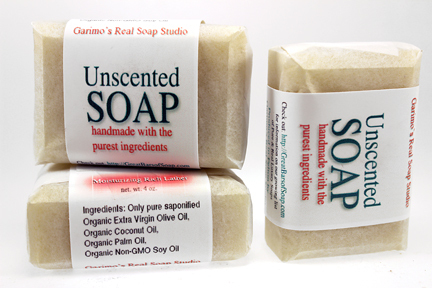 Unscented except for the natural herbal scent. Ingredients: Saponified Organic Extra Virgin Olive Oil, Organic Coconut Oil, Organic Palm Oil, Organic Non-GMO Soy Oil, Filtered Water, Pure Steamed Essential Spice Oils, Organic Green Tea, Organic Wheat Grass Powder, Rosemary Oleoresin Extract. Ingredients: Saponified Organic Extra Virgin Olive Oil, Organic Coconut Oil, Organic Palm Oil, Organic Non-GMO Soy Oil, Filtered Water, Pure Essential Spice Oils, Chopped Organic Oats, Rosemary Oleoresin Extract. 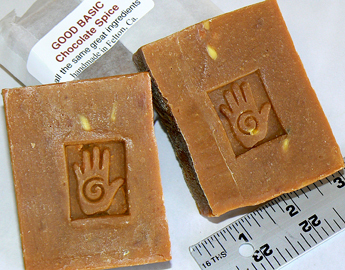 Ingredients: Saponified Organic Extra Virgin Olive Oil, Organic Coconut Oil, Organic Palm Oil, Organic Non-GMO Soy oil, Organic Cocoa Butter, Filtered Water, Pure Essential Spice Oils, Organic Peruvian Cocoa Powder. 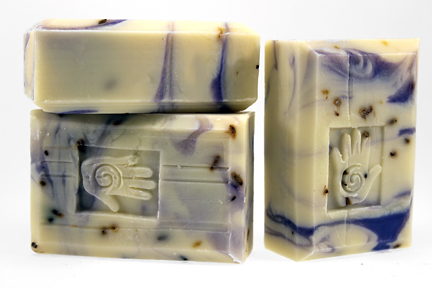 These bars are scented with lavender in the white areas and clove in the brown, the combination reminds me a litttle of a vanilla. Ingredients: Saponified Organic Extra Virgin Olive Oil, Organic Coconut Oil, Organic Palm Oil, Organic Non-GMO Soy Oil, Filtered Water, Pure steamed Lavender and Clove Essential Oils, White Kaolin Clay, Brown Iron Oxide. 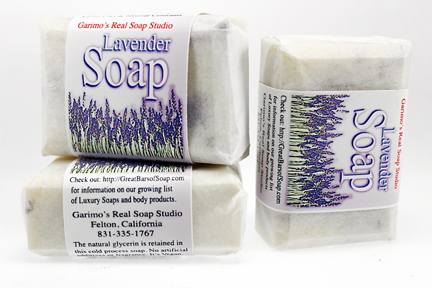 Ingredients: Saponified Organic Extra Virgin Olive Oil, Organic Coconut Oil, Organic Palm Oil, Organic Non-GMO Soy Oil, Filtered Water, Pure Essential lavender Oil, Organic Lavender Flowers, Kaolin White Clay, Rosemary Oleoresin Extract, Ultramarine Violet, Titanium White. 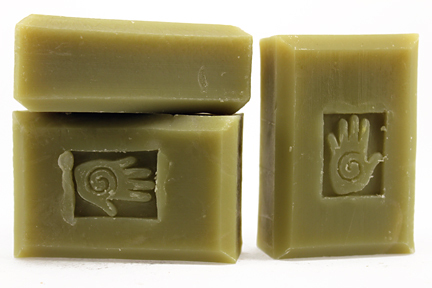 These bars are made with all the same great ingredients as all the other soaps plus edge trimmings and shreaded bits of all the soaps are added. It's all the mixed bits that makes these bars so colorful. 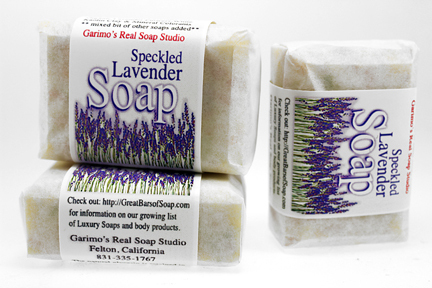 Some people say this soap has a stronger Lavender scent than the solid color bars. 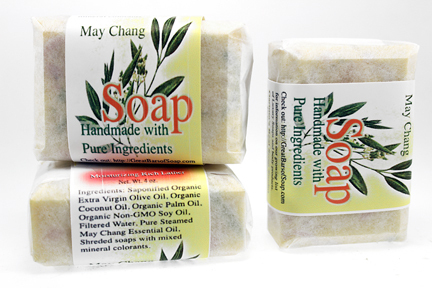 Ingredients: Saponified Organic Extra Virgin Olive Oil, Organic Coconut Oil, Organic Palm Oil, Organic Non-GMO Soy Oil, Filtered Water, Pure Essential Lavender Oil, Kaolin White Clay, Rosemary Oleoresin Extract. 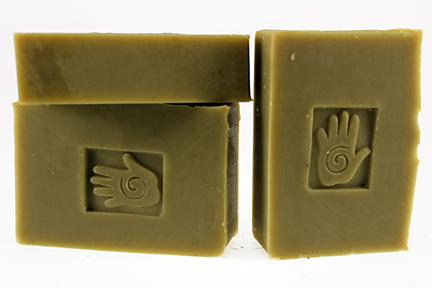 Ingredients: Saponified Organic Extra Virgin Olive Oil, Organic Coconut Oil, Organic Palm Oil, Organic Non-GMO Soy oil, Filtered Water, Pure Steamed Essential Tea Tree and Spearmint Oils, Organic Spearmint leaf, White Kaolin Clay, Rhassoul Clay, Rosemary Oleoresin Extract. 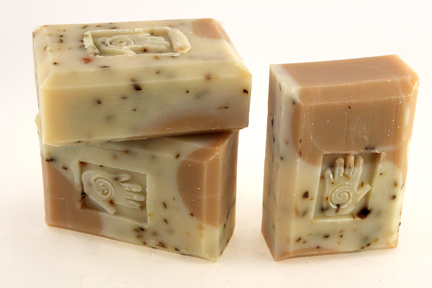 Ingredients: Saponified Organic Extra Virgin Olive Oil, Organic Coconut Oil, Organic Palm Oil, Organic non-GMO Soy Oil, Filtered Water, Pure Steamed Essential Tea Tree Oil, green oxide, and the speckled bits are little shreds of other soaps. Ingredients: Saponified Organic Extra Virgin Olive Oil, Organic Coconut Oil, Organic Palm Oil, Organic Non-GMO Soy Oil, Filtered Water, Pure Steamed Spanish Rosemary Essential Oil, Kelp Powder, Rosemary Oleoresin Extract. 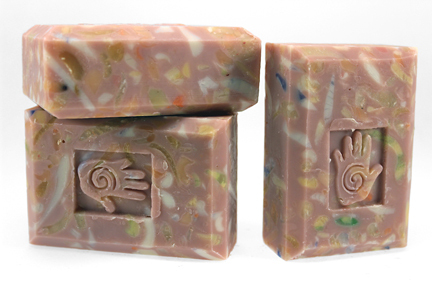 These bars are made with all the same great ingredients as all the other soaps plus edge trimmings and shreaded bits of all the soaps are added. It's all the mixed bits that makes these bars so colorful. 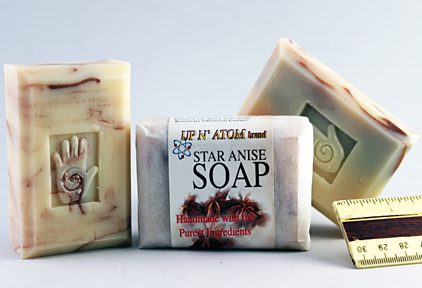 Great Bars of Soap. Ingredients: Saponified Organic Extra Virgin Olive Oil, Organic Coconut Oil, Organic Palm Oil, Organic Non-GMO Soy Oil, Filtered Water, Pure Essential Patchouli and a small amount of Clary Sage Oil, Kaolin White Clay, Rosemary Oleoresin Extract. Red Iron Oxide. 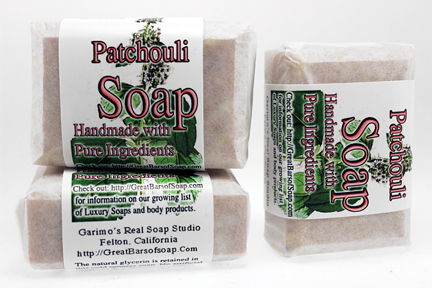 This soap has a little extra grit for scrubbing off that dirt from the garden or those old built up skin cells. 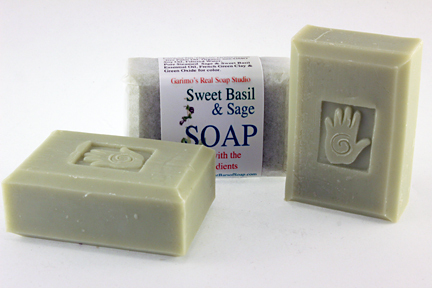 Ingredients: Saponified Organic Extra Virgin Olive Oil, Organic Coconut Oil, Organic Palm Oil, Organic Non-GMO Soy Oil, Filtered Water, Pure Steamed Peppermint Essential Oil, Ground Pumice Powder, Kaolin White Clay, Rosemary Oleoresin Extract Green Oxide. 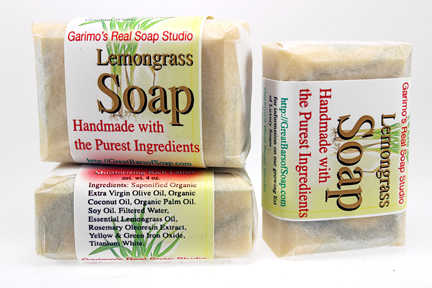 Ingredients: Saponified Organic Extra Virgin Olive Oil, Organic Coconut Oil, Organic Palm Oil, Organic Non-GMO Soy Oil, Filtered Water, Pure Essential Lemon Grass Oil, Kaolin White Clay, Rosemary Oleoresin Extract, Yellow & Green Oxide. Ingredients: Saponified Organic Extra Virgin Olive Oil, Organic Coconut Oil, Organic Palm Oil, Organic Non-GMO Soy Oil, Filtered Water, Pure Steamed May Chang Essential Oil, Mixed bits of soaps for addeds color, and Kaolin White Clay, Yellow Iron Oxide colorants. Ingredients: Saponified Organic Extra Virgin Olive Oil, Organic Coconut Oil, Organic Palm Oil, Organic Non-GMO Soy Oil, Filtered Water, Pure Essential Orange Oil, Organic chopped Oats, Organic Chopped Orange Peel, Rosemary Oleoresin Extract, Titanium White & Orange Oxide. It's a Austrialian Eucalyptus that have a very lemon scent to it. Ingredients: Saponified Organic Extra Virgin Olive Oil, Organic Coconut Oil, Organic Palm Oil, Organic Non-GMO Soy Oil, Filtered Water, Pure Steamed Essential Euclyptus Oil, Rosemary Oleoresin Extract, Multani Mitti Clay, Kaolin White Clay. 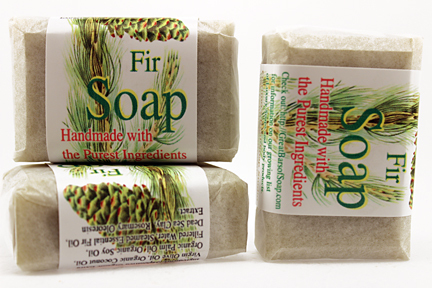 Smells like a hike in a pine forest! Ingredients: Saponified Organic Extra Virgin Olive Oil, Organic Coconut Oil, Organic Palm Oil, Organic Non-GMO Soy Oil, Filtered Water, Pure Steamed Essential Siberian Fir Oil, Rosemary Oleoresin Extract, Dead Sea Clay Clay. 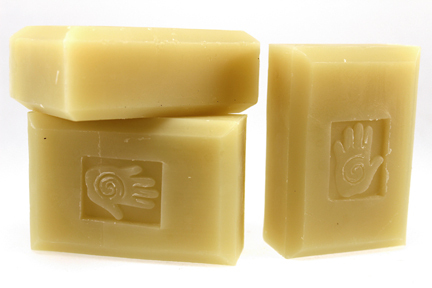 No colorants other than the natural oil colors, No fragrance other than a slight hint of the Tunisian olive oil. just a creamy moisturizing lather. Ingredients: Saponified Organic Extra Virgin Olive Oil, Organic Coconut Oil, Organic Palm Oil, Organic Non-GMO Soy Oil, Filtered Water, Organic Wheat Grass Powder, Silk Peptides, Rosemary Oleoresin Extract. 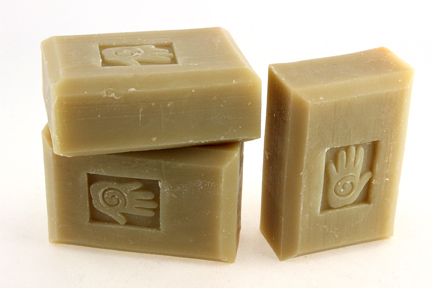 This soap is great for people with sensitive skin conditions. The chlorophyl in the wheatgrass and the amino acids in the silk peptides are very nurturing and healing for irritated skin. There are no added fragrances that are often irritants. 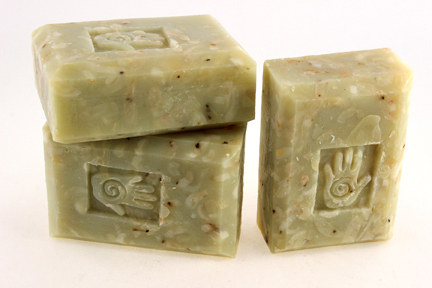 Try this soap if you have excema or other sensitive skin conditions. I think you'll like experiencing the moisturizing pure ingredients. 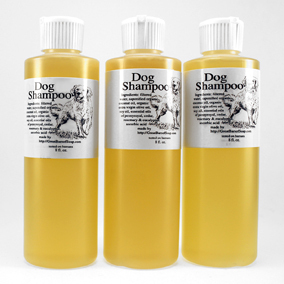 Ingredients: Saponified Organic Extra Virgin Olive Oil, Organic Coconut Oil, Organic Palm Oil, Organic Non-GMO Soy Oil, Filtered Water, Pure Steamed Pennyroyal, Cedar Wood and Rosemary Essential Oils, Rosemary Oleoresin Extract, Iron Oxide. 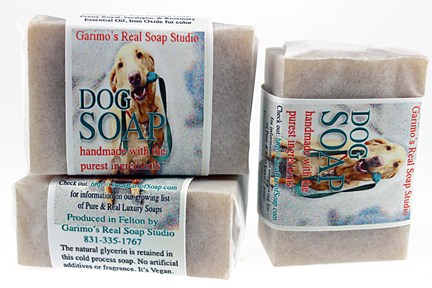 Scented to naturally repel fleas as well clean. 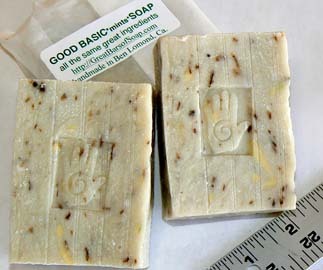 The following ~Good Basic~ Soap Bars are a great deal for a soap made with organic ingredients. These bars are re-batched soap trimmings. I take the extra bits of all the soaps and grate into small pieces. Then they're wetted and cooked for 4-5 hours or longer at about 150-200 degrees. 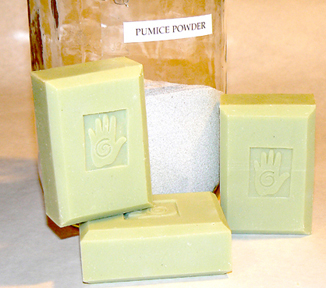 The heating lowers the PH a little more by forcing the soap through the saponification process a second time. 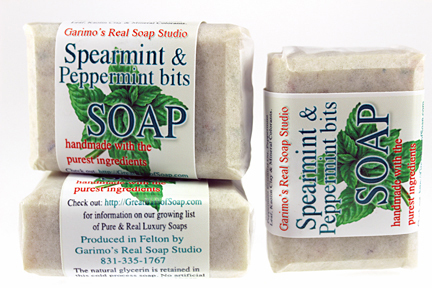 There are different blends, sometimes floral, of herbal, or minty, or cinnamon spice. 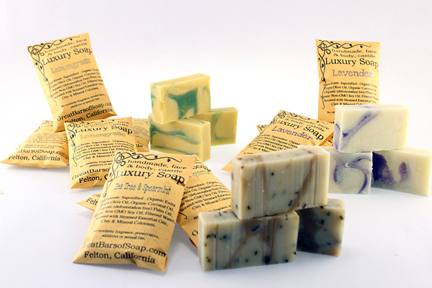 Using these soaps is kind'a like using all of the soaps at the same time. Sometimes I'll add some herb or more essential oil when recooking. 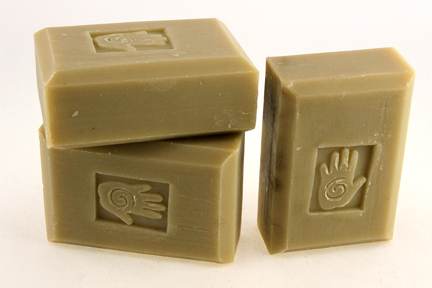 It's a good basic soap. These bars are larger than the others at 4.5 to 5 ounces. There are usually several kinds in stock. They're all great, not at all an inferior product, and it may just be my imagination, but I think they make even bigger sudz than the other bars. 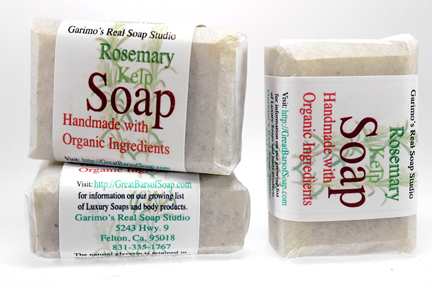 Ingredients: Blended soaps with lots of Lemongrass & some Rose Geranium Essential Oil. 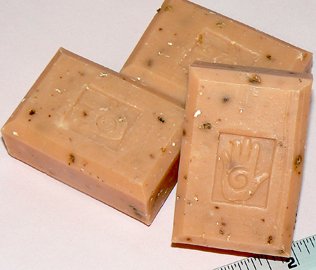 ingredients: blend of all the chai soap trimmings, scented with cinnamon, clove & allspice essential oils. 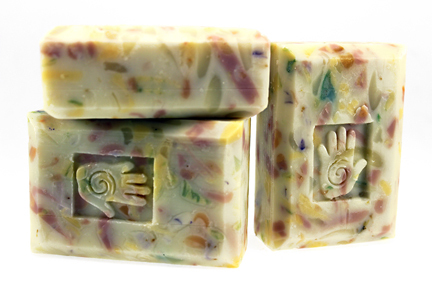 Ingredients: Blended soaps, scented with blend of Essential Oils. I wish you could smell them just by looking! 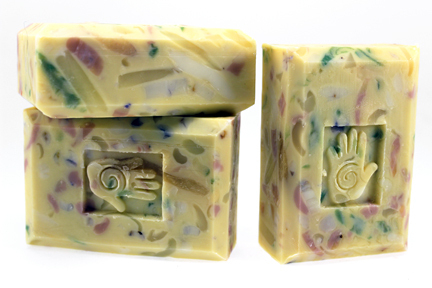 More soaps coming as soon as they're created!